Greta flexed her short thighs, holding an enormous and heavy hoof between them. A silver horseshoe, worn but nailed, reflected the intensity on her face. Using a pick, and hoisting that hoof up higher, for her balance and his comfort, her little fist dug for stray rocks and caked mud, like a doting mother removing a splinter from under her child’s fingernail. This equine senior could have been the subject of a Norman Rockwell painting: an old sway-backed bay Morgan horse in the final stages of his career, enjoying a pedicure lovingly delivered by a 10 year old girl. Folks at the farm knew him as Homely Herb, but to Greta, he exuded pure elegance, as talented a gentleman as any Lipizzaner stallion dancing to a Viennese waltz at the Spanish Riding School. Undeterred by worn withers and teeth yellow and long, she began to brush rhythmically to the beat of the romantic waltz, working up a luster sure to emerge from the sides of Herb’s well-worn belly, the same belly he would bloat when she tugged upward on the girth, trying to reach that distant leather hole. Her black Justin boots, generously accepting the cuffs of her Wrangler Jeans, traveled to the top of the step stool. There Greta’s panoramic view from the Hapsburg Palace of two stately pricked ears down to the comfortable rump of the Danube reminded her that the world is good. From withers to tail, the brush, guided in even and practiced strokes, swayed first east, then west, in a seesaw motion, as she curled her wrist from right to left in an ordered rhythm. Herb’s tail, coarse and black, slapped back to acknowledge her touch. Herb and Greta, partners in an old world dance. 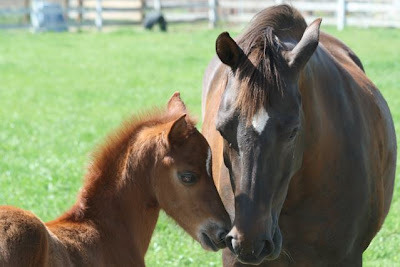 Photo by Rob Mezzetti 2008 “Morgan Mare and Foal” owned by Bob and Susie Morgan of TritonMorgans, Hollister, California. I just love this. Got my first horse at 14 through hundreds of car washings and babysitting jobs, kept him in a worn-down cow barn perched between Pasadena and East Los Angeles, and stayed out of trouble all through high school because I had a horse to support! That brings back memories. My dad used to ride Lipizzaner long, long ago. I remember him pointing out the good riders to me, the ones who had their heels down and the backs straight…. I had a little pony/foxtrotter, Cricket, who carried me over 2000 miles of scenery in Point Reyes and Yosemite during our ten years together. I’m catching up on some reading and just got to this post. Beautiful! I can feel the rhythm of dance coming through the flow of words.